As we plan to celebrate Mother’s Day on Sunday, I thought I’d take a moment to share some mother wisdom my friends shared with me. What did your Mom always tell you as you were growing up, or perhaps today? Her advice may have made you a better leader, team member, business owner, partner or friend. It may have helped you be more resilient, confident or courageous. For example, my Mom always said, “Don’t borrow trouble.” In other words, don’t worry about things that will probably never happen. 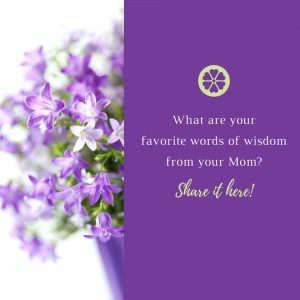 Take a moment to reflect on the words your Mom told you and consider sharing it here, so we can all benefit from her wisdom! “What’s on your mind, besides me?” To prompt a conversation. “It’s just as easy to fall in love with a rich man as a poor man. Marry rich.” Kelly and Rich have been happily married for 32 years! My mother always said: “It’s OK to dislike what a person does, but it’s not OK to dislike the person, because you don’t know what’s going on in the person’s life that made the the person say/do whatever they did.” She repeated it frequently and was the most non-judgmental person I’ve ever known.